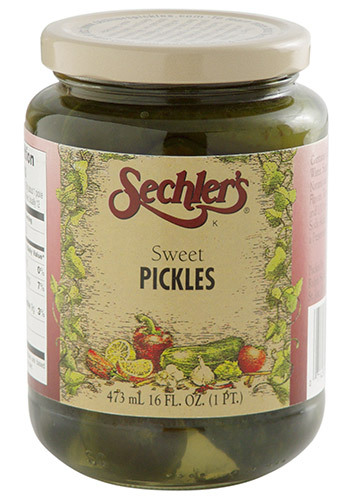 16 ounce Sweet Pickles are sweetened to perfection using pure sugar! of Soda Added as a Preservative. From Anonymous of West Branch, Iowa on 11/21/2016 . From Gretchen Tuck of Mpls, Minnesota on 7/24/2016 . I ordered these for my mother in law who grew up in Waterloo Indiana. She said "These are exactly the same taste as I remember them thank goodness! Now I can make my mother's famous potato salad" We all love them! From Drenzel of Dayton, Texas on 11/24/2014 . My wife is allergic to FDC Yellow #5 food coloring. This is the only brand we have found that does not contain FDC Yellow #5. We can't get them in any of our local stores (and we have asked) so unfortunately we must pay shipping which is expensive. Still cheaper than paying additional doctor bills.